It was revealed today that the group requested a meeting to discuss the findings, but did not receive a reply. Officials from the Department of Justice. A REQUEST FROM Rehab Group to meet with the Department of Justice to discuss the findings of an audit was not responded to — leading to the Department to report that the organisation was not co-operating. The Department had a three month window to do so, according to comments today at the Public Accounts Committee (PAC). Rehab CEO Angela Kerins said that she had written to officials at the Department requesting a meeting to discuss a recommendation that Rehab were to ‘review all aspects of their fundraising scheme to determine viability, through a reduction in the associate costs’. This letter, seen by the committee, was sent in August 2012. However, Secretary-General at the Department Brian Purcell said that this did not constitute the “formal” response required, where an organisation is to outline how they are to implement the recommendation. This meant that the audit could not be completed. In November 2012, the Department stated that they were to wind-down the Charitable Lotteries Compensation Scheme, leading to Rehab to launch litigation proceedings against the move. 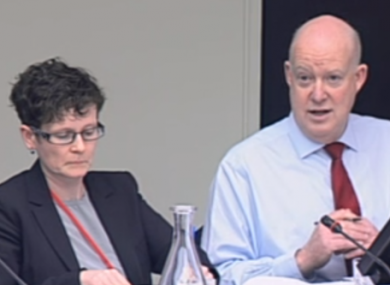 The Department could not respond to Rehab’s request for a meeting following this, and later reported to the Public Accounts Committee that they being non-compliant. “I’ve been pretty livid at at Rehab for now allowing you to conclude the audit,” Fine Gael TD Simon Harris, who led the round of questioning, said. “I had been given the clear impression that you were not able to complete the audit and that the implication was that Rehab was not responding to the recommendations”. “The letter says they want to help finalise the report,” he told Purcell. You guys dropped the ball, you didn’t come back to them. The audit also raised concerns relating to what was defined as “admin” costs, with Kerins arguing that the definition was too broad. Dr John McGuire, Director of Fundraising, said concerns were not raised following previous annual reports submitted to the Department that detailed what the organisation spent on admin, leading to Rehab assuming that they were compliant. Email “Department of Justice "dropped the ball" on Rehab audit”. Feedback on “Department of Justice "dropped the ball" on Rehab audit”.